What is the reverberation time? 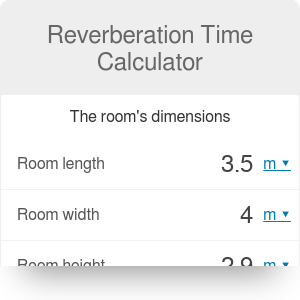 If you are interested in room acoustics, you should definitely give this reverberation time calculator a try. You can use it to define one of the most critical acoustical characteristics of any enclosed space: the reverberation time, which describes how the reflected sound propagates in a room. This article will give you an overview of how the sound behaves in enclosed spaces and provide you with a handy RT60 equation (also known as reverberation time formula). We will also give you examples of optimum reverberation times in rooms used for various purposes. Every sound is nothing but a wave propagating in space - either in the air or a different medium. When a sound wave is generated in a room, it travels forward until it reaches an obstacle. Every boundary of the room, such as the wall, the ceiling, or the window is an obstacle for the sound wave. Once the wave comes in contact with the obstacle, two things happen. Firstly, a part of the wave energy gets absorbed by the barrier, usually resulting in an exchange of heat. Secondly, the remaining portion of the wave gets reflected from the obstacle and begins to travel in an opposite direction. After some time, the sound gets reflected so many times that most of the energy becomes absorbed. As this happens, the sound pressure level (SPL) decreases. The time between sound emission and the moment when the drop in SPL reaches 60 dB is called the reverberation time. Reverberation is strongly dependent on the frequency of sound, so it must be carefully considered while preparing an architectural design. There are two ways to measure the reverberation time. The first one is to use a dedicated device - a level recorder that can plot the SPL against time. The other way is to calculate it, basing on the parameters of the given room. A is the effective absorbing area of the room, given in m². As you probably noticed, the RT60 equation looks deceptively simple. All you have to do is divide the volume of the room by its area and multiply it by a known coefficient. If you give the formula another look, though, you will discover that in reality, it is much more complicated. α is the absorption coefficient of that surface. The absorption coefficient describes what part of a sound wave energy gets absorbed by the obstacle. It can have a value between 0 and 1. α = 0 means that no sound is absorbed - an acoustic equivalent of a mirror. α = 1 means that no sound is reflected - this happens, for example, if you happen to open the window. Our reverberation time calculator can determine the effective absorbing area of any room with a regular cuboid shape. If you open the advanced mode, you will be able to customize the absorption coefficients of all room elements: walls, the ceiling, the floor, doors, and windows. You can find a list of absorption coefficients of commonly used materials under this link. The optimum reverberation time depends on the intended use of the room. If the reverberation time is too low, the sound will appear "flat," without the richness and fullness that should be included in any music we hear. On the other hand, extremely high reverberation times result in loss of articulation and increased difficulties when trying to understand speech. In general, high reverberation times are perfect for large music halls. Low times are preferable for lecture halls or recording studios. If there is no reverberation whatsoever, the sound levels are subject to the inverse square law. Reverberation Time Calculator can be embedded on your website to enrich the content you wrote and make it easier for your visitors to understand your message.